Nova Scotia’s blend of dramatic seas, scenic lands, Celtic music and friendly people shape a maritime culture like no other. Nova Scotia is located in Canada, on the upper east coast of North America, lying between the provinces of New Brunswick (in the west) and Newfoundland (in the northeast). Witness the world’s highest tide ebb out of the Minas Basin and beachcomb the ocean floor for treasures. Drive, bike or hike the Cabot Trail, Canada’s great ocean highway. Visit the province’s capital city, the seaport of Halifax. Or stop by the town of Lunenburg to see the home of the world-famous Bluenose II. Explore Nova Scotia's scenic destinations, from historic fortresses and pristine white-sand beaches to coastal hiking and cascading waterfalls. Exciting. Eclectic. Romantic. Halifax deftly blends the past with the present to produce a skyline dotted with elegant 18th- and 19th-century architecture alongside ultra-modern towers of glass and steel. The heart of Halifax is perfect for exploring on foot, with tree-lined streets, international restaurants, galleries, libraries and museums. Inviting sidewalk cafés beckon you to while away a few hours amid park-like, waterfront, and historic settings in the busy downtown, often with a backdrop of the bustling harbour, which entertains ship traffic from every corner of the globe. The Glooscap Trail evokes images of ancient legends and mysteries born of nature's beauty. Come and explore this special place, where the majestic power of the world's highest tides have shaped a landscape of unforgettable splendour. The Glooscap Trail follows the spectacular shore of the Minas Basin, whose nutrient-rich waters create an ecological diversity that make it one of North America's great natural treasures. This is a land where eagles and osprey soar, where moose graze in quiet marshes and fall migrations bring hundreds of thousands of shorebirds. From the seaport of Yarmouth, the tides of Fundy rise until they reach a high of up to 16.5 metres (54 feet) at the headwaters of the Bay of Fundy's Minas Basin. The Evangeline Trail parallels the Fundy coast, passing through some of North America's earliest European history and the delightful villages and orchards of the Annapolis Valley. Phenomenal Fundy is also rich in natural history, particularly migrating shore birds, whales, shad and other marine life. In late July and early August, before flying non-stop to South America, over two million semipalmated sandpipers refuel on the mud shrimp exposed by the receding Fundy tides. The Lighthouse Route journeys through an unforgettable landscape of coastal beauty and historic charm that has captured the hearts and minds of travellers for generations. Imagine the landscape as it was when Champlain and de Monts first arrived four centuries ago. Follow shoreline roads past rugged, wave-carved headlands and tranquil, island-studded bays. Discover historic towns and weathered fishing villages where legends of the sea come alive and the rhythm of life moves in harmony with the highest tides in the world. It's a journey that spans 400 years of settlement, a journey that will take you past fortresses, farms and fishing villages, a journey rich in culture, diversity, charm and natural beauty. Travel through the picturesque Acadian fishing villages that dot the coast of St. Mary's Bay. Visit Digby, home port to the world's largest scallop fleet. Take a side trip on Digby Neck for some of Nova Scotia's best birding and whale watching. 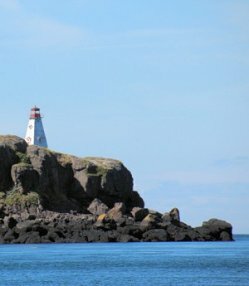 The Lighthouse Route follows Nova Scotia's South Shore, where the past is a part of everyday life. You'll find it along quiet country roads where ox teams still haul lumber, and coastal villages where fishermen still row wooden dories out to sea. Explore towns like Liverpool, with its privateer legends, and Lunenburg, where a working blacksmith still plies his trade amidst the beautifully preserved buildings of the old town district. There's a special beauty along the Sunrise Trail, too. Gently rolling farmlands create a quilt of emerald green fields that meets the sparkling blue waters of the Northumberland Strait. Country roads wind along sandy shores with their bright red bluffs and tidal saltmarshes that are vibrant with life. Timeless towns and villages, where generations have harvested the bounty of land and sea, now wait to be explored. Gracious inns, B&Bs, cottages and chalets offer a home away from home. There are fine restaurants, colourful shops and art galleries, as well as museums, summer theatre, and a fine arts centre. The traditions and legends of the sea come alive along the Marine Drive. Follow this special route through a land of pristine coastal beauty, where quiet shoreline roads lead through romantic seaside villages and the past is a colourful part of everyday life. Experience the sights and sounds of Nova Scotia's living-history museums: a fishermen's store and a goldmining complex in a 1940s village at Memory Lane in Lake Charlotte; a blacksmith's hammer ringing at his forge and a picturesque sawmill in a thriving 19th-century town at Sherbrooke Village. There are twelve beautiful provincial parks, and nature lovers enjoy exploring our hiking trails, sand dunes and wildlife-filled salt marshes. History comes alive along the Sunrise Trail. Pictou is known as "The Birthplace of New Scotland", and on the waterfront you can see the faithful replica of the ship Hector that brought the original Scottish settlers to these shores in 1773. The Marine Drive is a playground for nature lovers-a world of magnificent coastal beauty where unspoiled beaches and tidal inlets beckon, and salt marshes teem with birds and wildlife. The ruggedly diverse coastline is a world-class destination for sea kayakers, and the seaside parks provide picnic facilities and superb hiking trails at some of the province's finest sand beaches. Inland, you'll find a vast but accessible wilderness whose myriad lakes and rivers are legendary with anglers and paddlers. Welcome to one of the most beautiful scenic drives in the world. Named for famous explorer John Cabot, the Cabot Trail winds around the rocky splendour of Cape Breton's northern shore, ascending to the incredible plateaus of Cape Breton Highlands National Park. This magnificent highway is carved into the sides of mountains that rise high above the shimmering waters of the Gulf of St. Lawrence. Lookoffs offer unforgettable vistas of Cape Breton's rugged coastline, where pods of whales can often be seen just offshore and bald eagles soar aloft on the ocean breezes. Welcome to Cape Breton's rolling heartland, where the highlands meet the lowlands along the shores of the island's beautiful inland sea - the Bras d'Or Lakes. The Bras d'Or Lakes Scenic Drive circles the lake along shoreline roads that offer an ever-changing panorama of woodlands, farms and villages, and are ideal for walking, biking and birdwatching. The region is a major nesting area for bald eagles, and these impressive birds can often be seen soaring aloft or perched on shoreline trees. Cape Breton Highlands National Park encompasses one of Canada's most exceptional wilderness areas. The highlands are a colourful tapestry of woodland, tundra and bogs, where wildlife is common and moose are often seen grazing in the quiet shallows of lakes and streams. The Cabot Trail is a golfer's paradise with exciting, world-class championship courses that surround players with the magnificent beauty of Cape Breton Highlands National Park or panoramic views of the Bras d'Or Lakes. Known for its gentle, fog-free waters, beautiful anchorages, and hundreds of coves and islands, the lakes are an international cruising destination, attracting hundreds of boating enthusiasts every year. Visitors who want to get out on the water will find numerous boat tours available, from seabird tours and ecological sailing tours to elegant cruises. The Bras d'Or Lakes' unique tidal waters create a rich ecosystem that supports a dazzling array of wildlife. Hundreds of pairs of bald eagles nest along the lake shore and in the surrounding countryside. White-tailed deer, osprey, fox, porcupines and raccoons are also frequently seen. 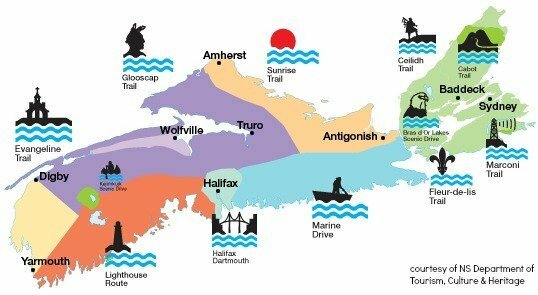 The Ceilidh Trail starts when you arrive in Cape Breton. Once you cross the Canso Causeway, follow Route 19 to your left and then follow the signs marking the Ceilidh Trail. This scenic trail is approximately 100 kilometers long (62 mi) and straddles the Gulf of St. Lawrence on the west side of Cape Breton Island. This trail ends in Margaree Harbour and it is here where you meet the Cabot Trail. The Fleur-de-lis Trail begins at the Canso Causeway and winds its way along the southeastern part of Cape Breton Island, where Acadian fishing villages dot the coast. Allow lots of time to explore these charming villages and the untouched wilderness between them. From the Fleur-de-lis Trail, continue onto the Marconi Trail, where a storied past will immerse you in its rich history. Enter the largest reconstructed fortified town in North America, the 18th-century French Fortress of Louisbourg, where costumed interpreters offer you a peek into their personas’ daily lives. The Ceilidh Trail is filled with little places here and there that are full of character. Small harbours with the local fishing fleet will be a regular sight. If you are lucky and there during lobster or crab season be sure to stop by to say hello to the fishermen and you might just be able to get some fresh seafood for supper. Music is a vital part of life in this region and the sounds of fiddles, pipes, and voices have long filled the air with sweet harmonious sounds. Feel the excitement at the award-winning Celtic Colours International Festival, a nine-day festival that brings the Island alive with music, energy, and excitement, at Glace Bay’s Savoy Theatre, a theatre built nearly a century ago to meet the specifications of Victorian show houses, and at the Louisbourg Playhouse, a theatre-in-the-round performance venue inspired by London’s 1599 Globe Theatre.